Well, Year 6 no more!! Today the class had their final day at St Paul’s. We celebrated with mass this morning and then spent the day getting shirts signed and spending time with our Reception buddies. You’ve been a fabulous class and I have enjoyed teaching you all and watching you grow into young adults. Have a fabulous holiday and good luck for September! Another active week in Year 6 this week! On Monday, after completing our Confirmation sessions, we visited the Brownlee Cycling Track for a few circuits, where we had the opportunity to try two different types of bikes and watched some elite triathletes in training. Tuesday was our trip to London!! We had a fantastic day: the weather was beautiful but not too hot; we went to the Houses of Parliament, the London Eye, the National Gallery, Buckingham Palace; and we even had time for ice cream!! I think all the children had a really enjoyable and memorable day. On Wednesday, amidst the play rehearsals, we had great fun on the giant inflatable that was in school. On Thursday and Friday we continued our play rehearsals. Don’t forget that we will be performing the play on Wednesday at 4pm and Thursday at 6.30pm. Happy St Peter and St Paul’s day!! And what a glorious day it has been! We had a lovely outdoor mass this morning in the sunshine, followed by our eighth Confirmation session, where we talked about one of St Paul’s letters and how he urges us to put our faith into action. We discussed how the Holy Spirit can help us to do this, especially when we use the fruits and gifts that he gives us. We had a great trip into Leeds City Centre on Tuesday, looking for the history of our city and spotting the owls of Leeds, that are hidden all over the place. The children who will be starting at Cardinal Heenan in September, went for a transition day at their new school on Wednesday and then returned there again on Thursday, with the whole school, for a fun run with the family of schools. Other than that, we have been practising for the end of year production. Next week we will be going to the Brownlee Cycling track on Monday morning, then to London on Tuesday (please be at Leeds train station no later than 7.50am), on Wednesday we have the giant inflatable in school and on Thursday Allerton and St John Fisher children have their transition day. Have a happy, Holy and sunny weekend!! What a great Health Week we had last week! On Monday we learned about the sugar content in everyday drinks, with students from Leeds Beckett University; practised some great skipping moves; were visited by d:side who gave us information about the risks of taking illegal drugs; and had a session out on our bikes (it was a busy day! ).On Tuesday we visited David Lloyd for a games session in the morning, followed by a dance session in school in the afternoon. Wednesday brought the climbing wall to school, which was great fun and then we had a fitness session in the afternoon. On Thursday we had a bit of a rest and a mindfulness session from Mrs Hourigan - reminding us that it is as important to have a healthy mind as it is to have a healthy body. Finally, Friday brought St Paul’s Sports Day, which was a great success and all the children did brilliantly and were excellent role models to the rest of the school. We also continued with our Confirmation journey last week and looked at the gifts of the Holy Spirit. Our Confirmation sessions for this week will be Monday at 2.15pm and Friday at 10.45am. Don’t forget, Friday is also the feast of St Peter and St Paul. We shall be having some special activities on Friday afternoon to celebrate our school’s feast day. Transition, Confirmation, money, football and Troy Story (I’m sure you know the words to plenty of the songs by now!) have been the key words this week. Wednesday 27th June - Cardinal Heenan. Our Confirmation sessions this week were about the gifts of the Son and reconciliation. The most important words we can regularly say are ‘please, thank you and sorry’. The stories of the Prodigal Son and Zacchaeus teach us about forgiveness and how, as long as we say sorry and show that we are sorry, God forgives us. In Maths, we have been focusing on money! Not spending it, but learning about how we can get money when we’re older, how we can manage it effectively and how we can possibly make money! Next week is Health Week at St Paul’s, finishing with Sports Day on Friday. Confirmation sessions will be on Tuesday at 9am and Wednesday at 10.45am. Welcome back to the final half term for Year 6 at St Paul’s! We have lots of exciting things planned for the class this half term and will try to make it a memorable and enjoyable time for them. Whilst we will still be having Literacy and Numeracy lessons, we will also be learning about the history of Leeds and Alwoodley; some local artists and we will be helping the children to prepare for their confirmations at the end of the term and transition to secondary school. On Monday we began this process with our SEAL around the theme of ‘Change’. The children discussed changes that they might experience at their age, before advising each other on how you can deal with these changes. They also created their own superhero alter egos! We have begun our topic work about the local area and the children got to look at photos of Alwoodley from over a hundred years ago! Many of the children were able to recognise the places in the photo as they haven’t changed too much, whereas other places (like the site of the Lord Darcy pub) looked completely different. This week we have also completed the first two of our Confirmation lessons about the gifts of the father and baptism. It was lovely to see some of the children’s baptism candles and photograph. The children are starting to think about who their sponsors might be and possible confirmation names. Thank you for your support so far with the children’s homework. We would welcome any parents who wish to join us for our Confirmation sessions. Next week they will take place on Tuesday 12th June at 2.15pm and Friday 15th June at 1.00pm. The class have had a very active time this week and it’s been very welcome after all the tests last week. We were really proud of how well everyone did on the Bikeability course on Monday, Tuesday and Wednesday. The children learnt some really important ways to stay safe when cycling on the roads and now know how to check that their bikes are also safe to ride, using the ABCD or M checks. A group of girls from our Book Club attended the Leeds Book Awards on Tuesday morning and had the opportunity to meet some authors. The winning book was ‘Letters from the Lighthouse’, which most of us chose as our favourite book, so we were delighted that it won! Both our U11’s football teams have taken part in tournaments this week, with the team of boys and Maddie winning their tournament and the girls coming third. We’re really proud of the achievements of both teams! Finally, all the class attended a triathlon at the John Charles Centre yesterday. This was a great opportunity for everyone to have a go at doing a triathlon and everyone managed to complete each event - even running and cycling in the rain! In between all this extra-curricular activity, the children have written some fantastic information texts about their Bikeability sessions and have considered how St Peter was transformed by the Holy Spirit. We also attended a lovely Marian service in church, presented by the Year 1 children. After half term we will begin our preparations for Confirmation. The first session will be on Tuesday 5th June at 2.15pm and the second session of Thursday 7th June, also at 2.15pm. Parents and grandparents are very welcome to join us for these sessions. Whilst we will try to keep the sessions at the same time each week, they will be on alternative days and times in some weeks, due to transition days and trips. The children should all be really proud of how hard they have worked this week completing their SATs tests. To complete the week, we’ve had a lovely day reading through our end of year play that we’ll be performing (Troy Story) and then this afternoon taking part in whole school activities to celebrate the royal wedding tomorrow. Next week we’ll be doing Bikeability sessions on Monday, Tuesday and Wednesday and then competing in a triathalon on Friday. In RE, we are focusing on St Peter and how the Holy Spirit transformed him and helped him to found the church. And in Literacy we’ll be explaining why dinosaurs became extinct! Have a lovely weekend, ready for the busy week ahead!! Discussing our behaviour as Christians. Well, April has departed and May is here! As it’s the month of Our Lady, we’re saying the Angelus each day in Year 6, at noon. Catholics have been praying around the world at this time for centuries, with the Angelus bell ringing to remind people to stop and take a few moments to reflect and pray to Our Lady. The class produced some lovely art work in response to the story of Pentecost in RE this week. Next week we will be considering St Peter and his role in the birth of the church. I have to confess, we’ve been playing Zombie Board Games, Top Trumps, Who Wants to be a Millionaire and Pointless in Literacy this week! Don’t worry though, they’re all to help us learn and revise grammar and punctuation terminology and practise our spellings. We’ve been doing lots of revising in Maths too. I haven’t set any extra homework in the CPG books this weekend but just asked the children to complete the books by SATS week if they want to use them to help them to revise. The Geometry book we will use in our lesson on Wednesday, when we’ll complete the end of the booklet which relates to data handling. I did send a reasoning paper home yesterday for the children to complete and bring back to school on Tuesday. It would be helpful if you could just give the specified 40 minutes for the children to complete the test, just to help them to think how much time they’ll have in the proper tests. Finally, Happy Star Wars Day!! Have a lovely long weekend that’s hopefully filled with sunshine! Mini Vinnies leading the Rosary. Grammar and Punctuation Top Trumps! This week we started reading a new book in Literacy called The Lost Happy Endings. The children have been using figurative language and expanded noun phrases to write their own alternative ending to the story, with some wonderful results. I’ll post some examples of the work when it’s completed. In RE, we have been thinking of how the apostles would have prepared for their mission after the Ascension. This has also allowed the children to reflect on how they can be young apostles. After a week of revising many different aspects of maths, some of the girls took over in Friday’s lesson and helped the class to revise how to find the value of missing angles. They did a great job and I’m more than happy for them to help plan and carry out some more lessons! More Maths! The girls takeover! Welcome back! I hope you all had a lovely, holy and relaxing Easter holiday! We commenced our Summer term with a SEAL day on Monday, where we began to discuss how we can deal with different types of grief. The children provided some excellent advice on how to cope when someone dies, moves away or a friendship changes. Canon Tim led a meeting about Confirmation, which will be taking place on Tuesday July 17th at Immaculate Heart Church. We will be carrying out the preparation for the Confirmation in school, over the six week period leading up to actual Confirmation. There are twelve sessions involved, so we will cover two a week. I will send more details about this before the end of half term, including the dates and times of the sessions, so there will be an opportunity for parents or sponsors to attend a session if they like. All enrolment forms should either be returned to school or to Canon Tim. Please do not hesitate to come and see me if you have any questions. In RE this week, we watched the Pope's Easter message and then had a go at writing our own Easter message, for children around the world. Here are extracts from Liliana and Maddie's work. Every year we are given the chance to carry on the job Jesus left us, to make the world a better place. Love, hope and faith are key to this. Like St Matthew said, don’t let your faith waver! CAFOD is an excellent charity that you could support. Jesus made a sacrifice during Lent – his life – so we should make a sacrifice by giving up something that will benefit others. We have written discussion texts in Literacy, where the children are debating whether the characters in the story Friend or Foe should report the German pilots that they have found, or whether they should help them. I'm really pleased to see how hard the children are working in Literacy and how they are trying to include all the elements of grammar and punctuation that we have been learning this year. We are also entering our final phase before the SATs tests, so are doing lots of revision and question practice, especially in Maths. I am encouraging the children to try to spend less time on their computers and phones over the next three/four weeks and invest some extra time into revising. I have not set Mathletics homework, as I think that it is important that the children now choose which areas of Maths that they feel they need to work more on and select those lessons for themselves. Improving their times tables skills, using the new Rock Star Maths website, will also stand them in good stead. Finally, we will also be finding time to relax a little over the next few weeks, with some guided visualisations and sessions about keep calm and not getting too stressed about tests and transition to secondary school. I think the children will be glad his week is over, since we have had our mock SATs week. But they should all be really proud of themselves, as everyone has made excellent progress and worked really hard. So it’s a case of maintaining this progress and the children challenging themselves to do even better in the actual tests in May. Next week I’ll be posting some websites on here, to help the children with their revision. Clitherow completed their fundraising activity this week, with an great bake sale, that raised around £100 for CAFOD and the Good Shepherd Fund. We’ve also been running a ‘Guess the name of the bunny’ competition, the results of which will be announced in an assembly next week. During the last week of Lent, we will be focusing on the events of Holy Week and what led to Jesus’ crucifixion and whether the trial preceding it was a fair one. Guess the name of the bunny! We’re over halfway through our Lenten journey and Merici House raised money for charity this week, by asking people to guess the number of sweets in the jar. The winner was Lucy in Year 1, who won all 220 sweets!! Well done Lucy! Next week is the turn of Clitherow House, who will be holding a bake sale after school on Wednesday. In RE, we are now starting to explore the events of Holy Week, why they happened and the meaning of them. On Monday we made a trip to Leeds Grand Mosque in Headingley, where Assad, a member of the mosque, gave us lots of information about the Islamic faith and made us feel very welcome. Something that we all found really interesting was how many similarities there are between Islam and our faith. Back at school, we’ve been focusing on the four operations in Maths this week and looking at how to apply them to solve word problems. On Wednesday, we celebrated a belated World Book Day, with Year 6 sporting some fabulous outfits, including Mr Stink, Thing One and Thing Two, Cruella de Ville, Hermione and Harry Potter and Pippi Longstocking. Thanks to the parents and grandparents who came in to read to the class. Next week, we’ll be holding a Mock SATs week to help prepare the children for the proper tests and to see the progress that they have made this half term. Enjoy St Patrick’s Day tomorrow and have a lovely weekend! Fisher reflecting on the Stations of the Cross. Thanks to all the parents who made it to the parent’s evenings. I know the children are really proud of their work and enjoyed being able to show you what they’ve achieved so far this year. Our fund raising has continued this week, with Fisher taking up the mantle and puzzling the pirates at St Paul by challenging them to find the Easter Egg treasure on the treasure maps! Meanwhile, Aquinas started our Stations of the Cross reflections in the prayer garden on Wednesday and thought about the first three stations and how we can relate them to our lives. In Maths lessons, we’ve been looking at measure: converting measurements and finding the area and perimeters of rectangles, parallelograms, triangles and compound shapes. In Literacy, we have started reading our new text ‘Friend or Foe’ by Michael Morpurgo, which is about two boys who are evacuated from London in the Second World War. The children are really enjoying the story and learning about the war and have started to produce some excellent writing. Don’t forget, everyone will need a packed lunch on Monday, as we will be visiting Leeds Grand Mosque in the morning. Stations of the Cross reflections. Our corridor display about giving hope. We’ve had a great start to raising money for Cafod and the Good Shepherd Appeal this Lent. Aquinas house held a Lucky Dip, where four lucky children won an Easter Egg and many others won sweets. Next week is the turn of Fisher house to hold activities that will raise money for our charities. A reminder for the children to start bringing in any money that they have saved due to giving up something for Lent, as part of the Cafod ‘Give it up!’ appeal. In Literacy, the children have written some informative leaflets about Fabian Hamilton, after his visit last Friday. Next week, we’ll be starting to read a new text set in World War Two. We’ll also be starting our new RE topic about Lent and Easter. Don’t forget parent’s meetings are next Wednesday and Thursday. If you have any problems with those days, please don’t hesitate to come and see me and we’ll arrange another time. Have a lovely weekend and keep warm!! Even though we’ve only been in class for four days this week, there have been lots going on in Year 6. On Tuesday we had a PSHE day and focused on our SEAL topic for this half term: ‘It’s Good to be Me’. We started with an assembly, celebrating what superstars we all are and why we’re all so great. Back in class, we acknowledged that despite this, sometimes we worry about things, which can make us forget about how fantastic we are. But there are lots of strategies that can help us to deal with our worries so that they don’t take over. We made our own worry doll to share our worries with. We’ll continue to do some work on this over the half term. On Thursday, Mary from Cafod came in to talk to the whole school about what we can do to help others in Lent. Year 6 will be leading activities throughout the school over the next 5 weeks. This starts next week with Aquinas House running a chocolate and sweet lucky dip at dinner times to raise money for Cafod and the Good Shepherd fund. The house captains will also lead the first of our reflections in church about the stations of the cross. Today we had another visitor when Fabian Hamilton and his wife came in to class to answer questions about his role as our local MP. He told us all about his day to day job and that he was inspired to go into politics by his parents and the values that they had instilled in him, which were to fight for a fair, just and equal society. Mr Hamilton also invited us to look around the Houses of Parliament with him later in the year, an invitation which we all happily accepted! Some of our worry dolls. Fabian Hamilton answering our questions. We started this week with our Under 11's football team winning 13-0 in a Bishop's Cup match - well done team! On Tuesday afternoon, we went to St Paul's Church to think about the different parts of the mass and what they mean. We have also been reflecting on what mass means to us individually. Next week, Lent begins and this is an ideal time for the children to attend mass more regularly, which will hopefully help them to deepen their understanding of the different parts of the mass and support them in their learning. The class have been completing assessments in Maths and Reading as well, which will help me to plan more effectively next half term to help us prepare for the SATs tests, which will take place in May, and for transition to high school. I have only set a bit of holiday homework! The children can either write a review of the film or book 'Stormbreaker' or a story for the 500 word competition run by BBC Radio 2 (this will ideally be typed up and on a USB stick or e-mailed to the school office, so that I can easily upload it to the competition page). The pages to be completed in the CGP books are for Friday 23rd February. Have a lovely half term holiday and don't forget, teachers have a training day on Monday 19th February, so school reopens again on the 20th. Discussing parts of the mass. Trying out our invasion games. Many of the children finally finished some wonderful action-packed short stories/ mini novels this week. I’ve really enjoyed reading them and I think the children have really enjoyed writing them too! You can find extracts from three children’s stories below. Next week we’ll be getting a little more serious and writing a newspaper report. Maths has found us cracking codes and solving algebraic equations - tricky at first but once we got our mathematical minds working, we were finding solutions with ease. I’ve set some work on Mathletics to help to consolidate the learning this week. We finally started working with Ben from Leeds Beckett University, who is working with us in PE, to help the children to design their own games. We also started our new RE topic this week: ‘Jesus, the bread of life’. In this topic, we’ll be learning all about the different parts of the mass and the importance of Holy Communion. This week we recapped what Passover is and how Jewish people observe it and then tried to interpret the signs and symbols in Da Vinci’s painting of the Last Supper. Thursday was a very busy day for us! After our class assembly (thanks to the parents who were able to come to watch), we celebrated Burns Night with some haggis and Irn Bru, which most of the class enjoyed! We then celebrated the Feast of the Conversion of St. Paul by looking at some of his letters and considering what kind of letter he might write to people like Donald Trump or Lionel Messi today, advising them how to use their power and money. The whole class have been absolute whizzes this week, finding fractions and percentages of amounts in Maths. Whilst in Literacy, the children have been producing some fabulous writing - I’ve really enjoyed reading their work and they should all be really proud of the quality of work that they are producing. From next week, PE will take place on Thursday afternoons, as we will be starting our project with Leeds Becket University. Fractions, decimals and percentages have been getting our brains whirring in Maths this week! We’ve been learning about Islam in RE and have explored the Five Pillars of Islam and how they shape and guide a Muslim’s life. In a couple of weeks, we will be visiting the Grand Mosque in Headingley, to learn more about Islam. In ICT, we’re creating video reviews of the play version of ‘The Lion, the Witch and the Wardrobe’ using Adobe Spark. Hopefully I’ll be able to upload some of them next week when they’re completed. Our Literacy work continues to be strictly confidential but we can let you know that we’re creating some of our own characters in preparation for writing a story next week. Have a lovely weekend and don’t forget our assembly next Thursday at 9am! Learning about Islam in RE. As you can see from our photos below, it’s been an eventful week in Year 6. Our work in Literacy is top secret, so we can’t tell you too much about it but it has involved writing a diary entry and completing a fitness report about one of our classmates. The class have demonstrated a great knowledge of fractions in Maths, pitting their mathematical abilities against each other to win a special treasure! Our first classroom worships of the new year were led by Nuala and Jessica last week and Liam and Darragh this week, reminding us all about new beginnings and welcoming Jesus into our homes and hearts. Then yesterday, we had a great trip to the theatre to see ‘The Lion, the Witch and the Wardrobe’ at the West Yorkshire Playhouse. Hopefully we’ll have some reviews for you about the performance in the next week or two. A visit from some book characters. Happy New Year! And welcome back to everyone. I hope you had a fantastic festive period and just wanted to say, on behalf of myself and Mrs Turner, thank you for all the lovely Christmas gifts, it was really kind of you. We’ve had a good first two days back - which ended with us catching up with our Reception buddies. It’s nearly the end of the first term in Year 6! We’ve been busy preparing for Christmas: singing carols, rehearsing for our Advent services, starting to make Christmas cards and decorations, watching the Key Stage One/Early Year’s Nativity and being Advent Angels. Many of the children also took part in Sports Hall Athletics on Monday evening and came second, then in swimming gala on Tuesday the school came first! Well done to all the children who took part. The girl’s football team didn’t do quite so well last night though and were defeated for the first time this season (we blame the opposition’s pitch). Don’t forget that Monday is our party day!! Year 5 & 6 joining forces to complete some maths. Practising for the Advent Service. As it’s the first week of Advent, the children have been going out of their way to be extra kind to their Advent Angels in class. The girls in the choir performed beautifully on Tuesday at the Community Cafe in the school hall in the afternoon, then again at Leeds Town Hall in the evening. Both the boys and girls football teams continued their winning streaks in the chilly weather on Thursday. It has also been our final week with Miss Cruickshank working with us - we’ll really miss her and wish her all the best for the future! We have been continuing our journey to becoming dragonologists this week and made a very exciting discovery in the school grounds on Tuesday morning! But it can only be discussed with fellow dragonologists I'm afraid!. We've written some great non-chronological reports about dragons though, using some fantastic description and imagination. In Science we have been exploring how electrical circuits work and are beginning to use the scientific symbols to draw simple circuits. We have also completed some tests this week and I've been really pleased with the positive attitude that the class have had towards them. We have also begun to prepare for the Advent season by decorating our classroom, writing our Advent promises and making our Advent wreath. Many of the girls have been practising hard for their Christmas Carol performance at the Town Hall next Tuesday evening, which I'm looking really forward to! Finally, we've been doing lots of sport, starting the week with lots of the class taking part in a Cross Country Competition. 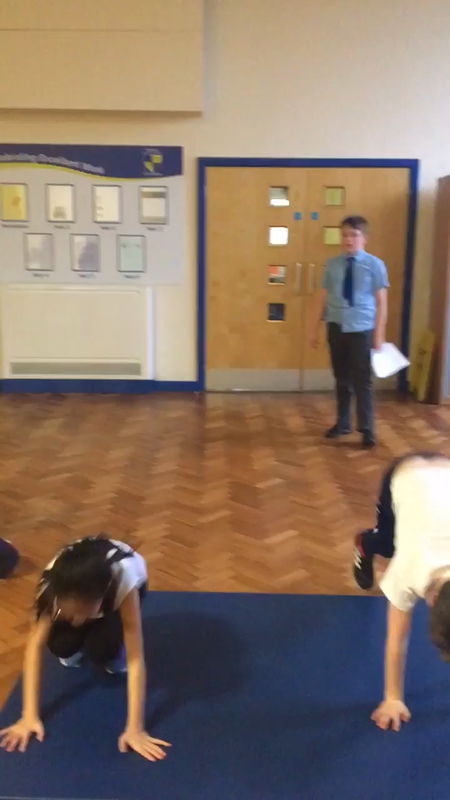 We perfected our gymnastic routines in PE with Miss Cruickshank; played some rugby dodgeball with Dan on Friday and the Under 11 football team had a fantastic win in the snow against Carr Manor Primary. Year 6 discovered that someone had left us a very special book all about dragons this week! So we have now become trainee dragonologists! After Professor Darkfire and Professor Stickleback spoke to us about dragons this morning, we found some dragons in the classroom this afternoon! It’s all very exciting!! In RE we have been continuing to think about justice and debated whether or not Brazil should have hosted the last football World Cup or whether they should have invested in hospitals, schools and improving housing for people living in the favellas. See you all on Sunday for the Christmas Bazaar! Discussing what we know about dragons. Professor Stickleback and Professor Darkfire. Debate teams at the ready. Friendship week this week has found us thinking all about our friendships and how we can ensure that we are friendly to everyone, so following the example set by Jesus. Year 6 have specifically been thinking about our online interactions and how we talk to other people on social media like Instagram, What’s App and Musical.ly. We discussed how it is important to know exactly who we are are interacting with, why we should be positive in our comments and what we should do if we feel uncomfortable with any interactions we are having. https://www.thinkuknow.co.uk is a really useful website that we can use to help us think more about how to keep safe online and tells us how to report something if we feel the need. Every week is friendship week really and we’ll be continuing to look at relationships and online safety regularly throughout the year. Today was Children in Need day and Year 6 really demonstrated what mature young adults they are becoming by organising activities for the house teams in KS2 this afternoon. Bun and biscuit decorating, party games, scavenger hunts and movie making were just some of the activities that took place for our Spotty Afternoon. Well done kids - it was a great success!! An update on our mould experiment! The start of a Streetchild narrative. This week in Year 6 we started our new RE topic ‘Justice’. We began by looking at the banana trade and how fair the distribution of profits are. Then yesterday we pledged our support for CAFOD’s ‘Power to be’ campaign. You can find out more about this at https://cafod.org.uk/Campaign/Power-to-be/Energy-campaign. In Literacy we have starting reading a new text called ‘Streetchild’ by Berlie Doherty, which is about a poor boy in the Victorian times. In order to try and empathise with the characters involved, we did some role play activities in pairs to imagine how we might feel being left to work in a rich person’s house. Our Maths lessons have been all about fractions and we’ve shown some excellent knowledge of factors to help us simplify fractions. Science has been continuing our work on classification. This week we used the iPads to help us to classifying different animals and work out their scientific names. We also set up our mould investigation. We’ll make sure that we take plenty of photographs what happens!! We’ve also got some new homework books! The pages to complete for next week are: Arithmetic pages 1,2,4 & 5 and Spelling pages 4 & 5. First of all, thanks to all the parents who made it to the assembly. We didn’t have very much time to practise it, since we had a training day on a Monday and mass on Wednesday morning, but the whole class did really well. It was also lovely to meet so many parents at the parent’s evenings on Wednesday and Thursday - thank you for taking the time to come in and discuss your child’s progress and look at their work. Back in the classroom, we have been revisiting factors, multiples, prime and square numbers in Maths. Out in the playground, we had our first PE session with Dan from Leeds Rhinos. This week we started with some games inspired by rugby. We would also like to welcome Miss. Cruickshank who will be working with us this half term. Any idea what BIDMAS stands for? Plickers - a great interactive resource! Well, it's been a wonderful week at Buckden for Year 6. Another lovely morning had us outside building dens and creating some natural art before we hopped on the bus back to Alwoodley. Don't forget, our assembly is Thursday 2nd November, when we'll be telling you more about our adventures! A bit wet today unfortunately! So damp conditions in the afternoon. But everyone still scrubbed up well for the disco in the evening (especially those who visited Miss McIntyre's hair salon!). What beautiful weather we've had today! Two lovely walks from Kettlewell in the glorious sunshine; high ropes; low ropes and another gyhll walk. Tonight Mrs McGurk is entertaining the groups with games galore! Today has been a bit blustery but fairly mild and no rain thankfully! Buckden has been on our brains this week! That and assessments! But in the middle of it all, we've had some time to nurture our artistic side which you can see from our musical performance in the video below. Thank you to all the parents who attended the meeting about Buckden on Thursday. It was lovely to see so many of you there! If you could return the forms as soon as possible then that would be really appreciated. This week we've been learning more about the art of persuasion in preparation for us to persuade Mr Bowker to agree to some things we think would improve the school and our education! In Maths we've been using written methods to divide - not just by one digit but by two! As usual, the whole class has risen to the challenge and worked really hard with great success! Thinking about persuasion in Literacy. Goals galore for the girls' U11 football team. 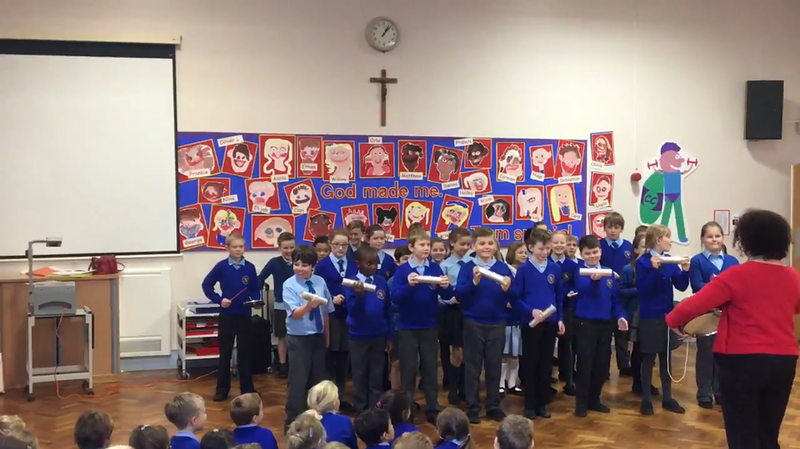 Year 6 Mini Vinnies leading the Rosary. Thank you for the Harvest Festival contributions! Father Josh paid us a visit this week and very kindly presented us with our Miraculous Medals. We have been learning about St Catherine Laboure, who saw a vision of the Miraculous Medal in 1830, when Our Lady visited her. A teacher from St Vincent de Paul RC Primary in London (who have the back of the Miraculous Medal as their school badge), kindly had a set of medals blessed and then sent them to us. Father Josh also answered our questions about what inspired him to become a priest; what his favourite thing about being a priest is and why he came to our parish. It's been a hard-working but enjoyable week. In Literacy we have continued reading 'Wonder', considering the theme of kindness and try to empathise with different characters. One of our favourite quotes from the book is: “If every person in this room made it a rule that wherever you are, whenever you can, you will try to act a little kinder than is necessary - the world really would be a better place. And if you do this, if you act just a little kinder than is necessary, someone else, somewhere, someday, may recognize in you, in every single one of you, the face of God.” This is something we are adopting as a class motto. We also had a great lesson in Science this week - we were classifying sweets! Yum yum! Reading and digesting the text. Discussing how to prevent bullying. 15.9.17 We have had a great start to Year 6. I have been made to feel very welcome by all the children and the staff at St Paul's, especially by Year 6. We are currently reading Wonder in Literacy and consolidating place value in Maths. One of our favourite activities has been helping our Reception buddies to settle in! We love our Reception buddies!